Purchase our “Buddy Pass” ticket if you’d like to bring a friend AND save on the price for each of you! This 4 hour classroom-only course (no live fire or test required) far exceeds the application requirements for the most sought after and desired permits in the country. Additionally, this course far exceeds the requirements to apply for an Oregon permit. A multi-state permit does not replace your home-state concealed carry permit. The non-resident concealed carry permits issued by Arizona and Utah are referred to as “multi-state” permits because both permits are recognized by at least 30 states. Although some people prefer to apply for more than one multi-state permit, it is not necessary to do so. Our customers typically choose to apply for whichever multi-state permit affords them coverage in the most states possible (which is dependent on state of residence). As an example, most WA residents apply for the Utah multi-state permit and the Oregon permit (because Oregon accepts only their own permit). Please understand that a multi-state permit does not necessarily or typically negate the need for a home-state permit – see our FAQ page for a detailed explanation. During your course, we do a lot more than just cover the course curriculum, as we also provide: both multi-state applications; three completed fingerprint cards; 2×2 photos; required copies; proof of training certificates for both multi-state permits; training certificate to apply for an Oregon permit; and pre-addressed envelopes. All of that is INCLUDED in your course fee — we DO NOT charge extra for fingerprinting and photos. The only thing you will need to do after taking this course is include the state background check fee, affix adequate postage, and relax while you wait for your permit to arrive in the mail. Please note that the state background check fee is separate from the course and is paid directly to the state. 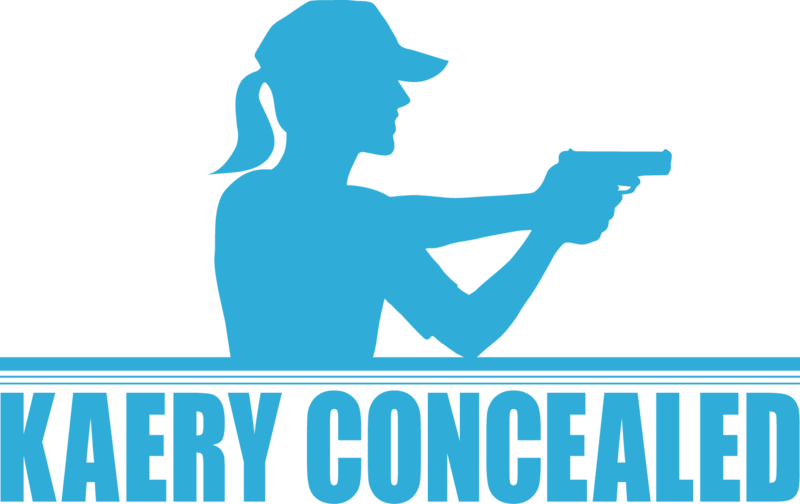 Kaery is a full-time firearms and self-defense instructor who resides in the Pacific Northwest. In 2003, she earned a Master of Education (with an emphasis in Curriculum Development for the Gifted) from Whitworth University and has been teaching for more than 25 years. She is certified by various national and international self-defense training programs (Rangemaster, National Rifle Association, SABRE Protection, The Well Armed Woman, WA Department of Fish and Wildlife, Utah Bureau of Criminal Identification, and Law of Self Defense) and she has trained under some of the most respected instructors and thought-leaders in the self-defense industry to guide everyday civilians through the complex legal, moral, and social ramifications of the use of force in self-defense. Kaery, offers corporate, group, and private courses for civilians all over the Pacific Northwest. Kaery and her husband, Eric, are the proud (and often exhausted!) parents of 7 children ages 19, 17, 12, 12, 8, 7, and 6. As a family they enjoy water sports; GLamping; making music; reading (and writing–daughter #1 enjoys creating and publishing books); shooting sports (and holster making–Custom Comfort Holsters is owned and operated by son #1); and ATVing all over the Pacific Northwest.